Rent Hilton Waterfront Beach Resort | Corporate Events | Wedding Locations, Event Spaces and Party Venues. The Waterfront Beach Resort is an event planner's paradise, with panoramic views of the Pacific Ocean and four-diamond personalized service. Recognized as a top Southern California choice for meeting and events, the coastal retreat provides the ideal setting for any occasion. The resort features over 21,500 square feet of flexible function space, state-of-the-art audio/visual equipment, wireless connectivity and richly appointed furnishings. 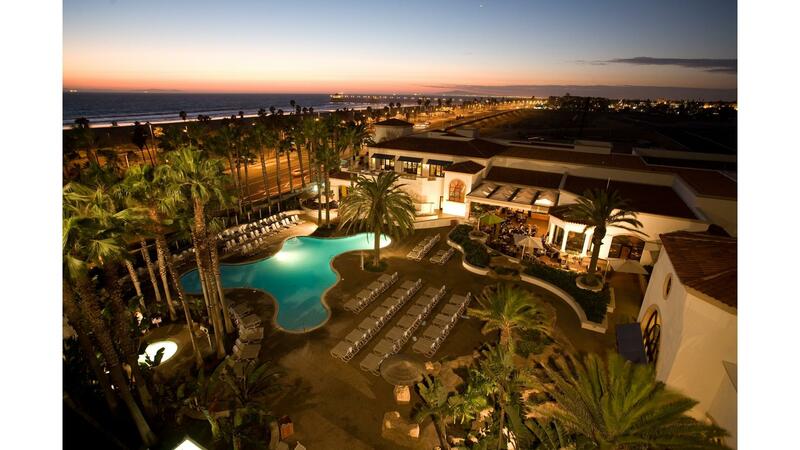 Acclaimed for its two ocean view ballrooms, including the 5,850 square-foot Grand Ballroom and the 2,800 square-foot, ocean view Tides Ballroom, the coastal retreat also offers multiple event spaces in various sizes. Abundant outdoor event spaces compliment the interior locations and offer privileged event participants something rarely experienced at most event locations - ocean breezes, the sound of the surf and unparalleled views of the Pacific Ocean. Thanks to the perfect beachfront location, incredible facilities and a partnership with Waterfront Adventures, The Waterfront Beach Resort provides guests with everything they could ever want. Heated pool with ocean views, boogie boards, treadmills, surf lessons and more - your hardest decision will be which one to choose.